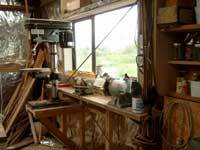 While all this is going on, I am still gradually building my workshops interior, I completed some of the electrical wiring the other day, and now have 12 live electric power points instead of one, and have just finished the sharpening and grinder bench. I have a rough grinder, a slower speed fine grinder with finer grit pink and white soft stones, and a wet grinder for very fine edges. You can see the drill press there, and the next job is to build shelves and a bench at the end of the building that will be the "engineering"area for working metals. We have just been talking over the engine box layout, the fuel tank (and the position of its filler and vent), the lockers (and spaces all around that area) and how to bolt the engine bearers in. This has been occupying our thoughts for a while now, and as other jobs are completed the need to get on with it draws nigh. So I have a drawing job to do. Charlie is doing the panel work in the area; making the box close to airtight so we can get some effective reduction of the noise the little diesel will make, and figuring out how to fit the mixture of second hand and new equipment that will mount the motor and provide it with all the functions that it needs to operate. 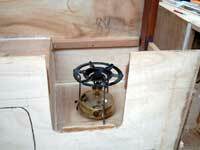 We have to find a through hull fitting to admit the cooling water, a ball valve to shut that off when not required. An exhaust which has a water trap muffler built in which not only deals with the hot gases but carries away the hot water as well. 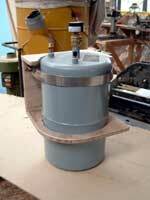 There is a fuel tank to find and fit, filters and fuel lines, all located so that they can be accessed for servicing. The starter battery and connections have to be mounted so that they are secure if the boat gets knocked down. 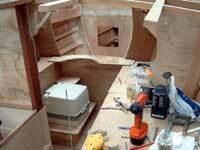 A toolbox where spares and tools are stored close to the point of use must also be built. One of the things that we are pondering is how to get the little engine up over the side and into the boat without dropping it. We don’t have room for a crane inside, and that part of the boat is not under one of the steel beams that hold the shop roof up, so its probably going to be a straight lift from floor to a portable bench, then in through the still open transom onto a couple of planks on the cockpit floor framing, then a lift onto the bridgedeck and a (much easier) lift down onto the cabin floor. The little Bukh weighs in at 64 kg so its liftable. The heater has a 2 US Gal tank that should mean a refill about every four days if used for evenings and mornings. Trying to carry that amount of kero down below in a plastic container and to pour it into a funnel is likely to end up with some missing the opening so the tank will be mounted in this quick release bracket that lives on the forward side of B# 4, that’s the one that forms the forward side of the galley. This genuine Primus brand pressure kerosene cooker was bought over the internet, Trade Me and Ebay have been a very useful source of equipment for this boat, and watching what Charlie has been doing, and seeing the bargains that he’s bought I’d recommend internet trading for parts if you are building anything from a little dinghy to a small ship. The cooker sits down in an enclosed space ( yes there is enough ventilation to get air to it) where it cant spill hot food on the crew. It will be gimballed, and the opening in the galley front will have a sliding door that allows access to the cookers filler, pump and control valve. The engine installation is quite a big job, and soon we’ll be able to show you how we did it. 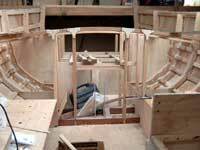 In the meantime I have been up to visit my favourite plywood place, and have brought home 14 sheets of plywood of various thicknesses, there is enough there to complete the interior, build the decks and cabin sides and the cockpit. Gordon was his usual helpful self and tells me that lots of JW Builders have been in for plywood and glue, thanks guys. As the voyage comes closer, we think more thoughts of route and distance, comfort, food and such. Charlie has been building the area around the galley, and made some changes to accommodate the pressure kerosene heater, built a mounting for the heater fuel tank that allows the tank to be dismounted and taken out in the cockpit for filling, nothing as sick making as the stink of kerosene in the cabin so avoiding spills is high on the list of priorities. The single burner kerosene cooker will be mounted on gimbals, and after thinking over the time and effort required to make them it was decided to investigate buying a set of Sea Swing fittings which would save a lot of metalwork. A view forward into the heads and anchor tackle lockers. Note the steps built into the furniture so it is possible to climb up and out of the forward cabin through the forward hatch without standing on things not intended as a ladder. Its not far off time to start painting, at least the interior primer. We will need about 16 litres of the low viscosity high penetration primer that we have chosen, and fetching that is something else to do next week. While investigating closed cell foam for another purpose, I came across a company that has a very soft low density 40mm thick waterproof closed cell foam in bulk sheets. They now have a sample coming so we can consider it for use as bunk upholstery, the advantage being that it is good insulation, soft, can be allowed to get wet and still just wipe dry. I’ll keep you posted on that stuff, two layers should make a fair bed. A job that needs to be done soon is the drilling of the keelbolts, a job that will require a very precise hand, wish us luck!